We are celebrating our one year anniversary at our new location in Skagit County! Heartfelt thanks to all the community members, partner agencies and staff for so generously giving their time, resources, heart and more! Read more about our first year of success in the Skagit Valley Herald by clicking the box below! On April 25, 2017 Governor Jay Inslee signed Brigid Collins initiated House Bill 1931 (Rep. Hayes), related to posting child abuse and neglect mandated reporter requirements. Although vital to protecting the children of Washington State, it is only the first step in our commitment to safer, more aware, and skilled organizations regarding child abuse safety standards. There is still much work to be done this session on our $318,000 capital project and proviso ESSB 5048 (derived from HB 1784), a pilot program requiring youth-serving recreational programs to develop and implement a child safety policy that meets the minimum standards set forth by the Centers for Disease Control. Thank you to all who have contacted legislators on behalf of our policy initiatives! Brigid Collins’ Board Member Mike Cook tells The Bellingham Business Journal that Stewards of Children training is good for business, calling it, "The best two hours you'll invest into employee training this year!" To learn more, read the full article by clicking the link below. 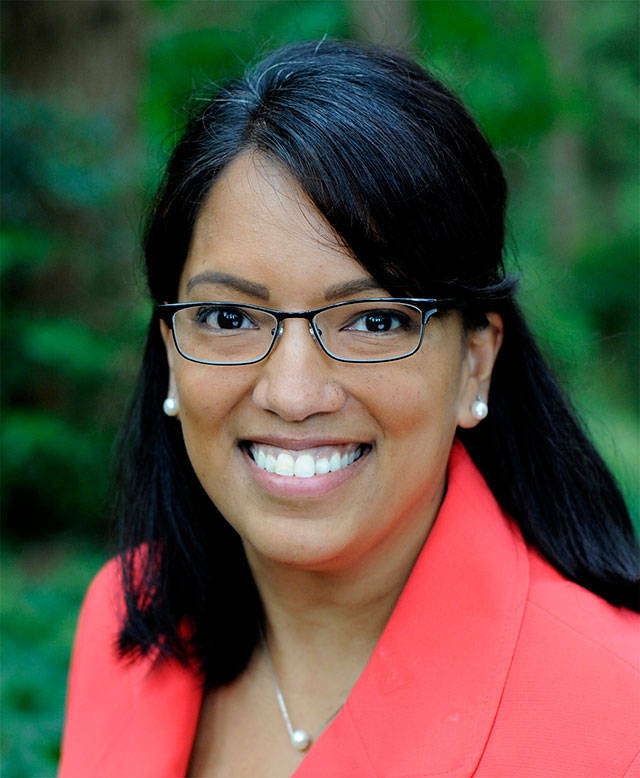 Representative Kristine Reeves of Federal Way voted yes for the Brigid Collins proviso (derived from HB 1784 - Rep. Smith 10th District) that “requires the Department of Health to develop programming to reduce the likelihood of child sexual assault in youth serving organizations”. Here is what she had to say about it in the Federal Way Mirror: “Our kids need programs that help prevent sexual abuse and, if they are survivors of assault, how to report it to the proper authorities. I’m proud to support a budget that puts our children and our families first.” - Rep. Kristine Reeves, D-Federal Way. 2017 Lee Ann Miller Award presented at the Children's Justice Task Force Conference. 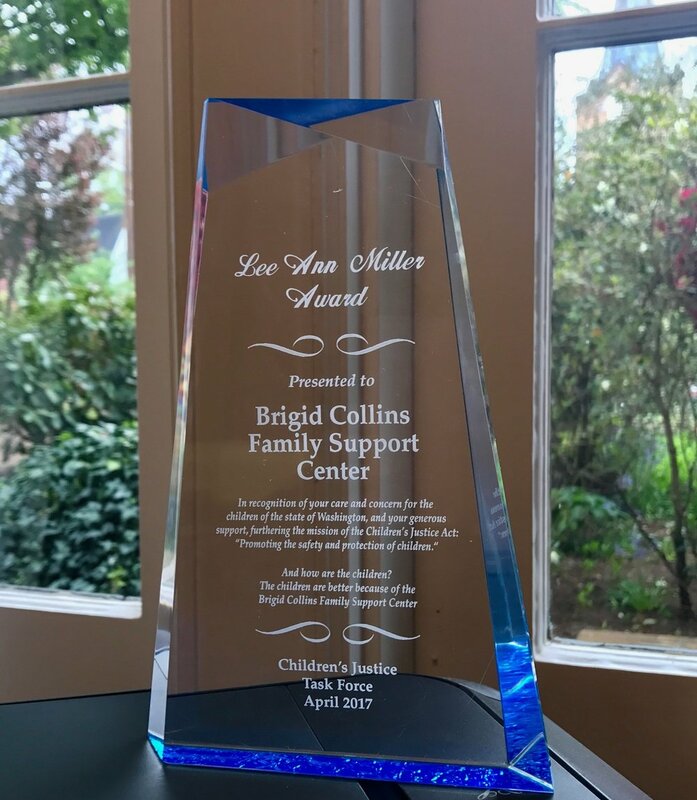 Brigid Collins Family Support Center is the recipient of the 2017 Lee Ann Miller Award, presented at the Children's Justice Conference on April 11th! Thank you to the Skagit County Prosecuting Attorney’s Office for nominating us and highlighting our efforts to promote prevention, healing, and justice in the communities of Skagit County. Congratulations to the staff, volunteers, partners, and children and families who bring hope and pride to our work to nurture children and end child abuse! Executive Director, Byron Manering and Skagit Children's Advocacy Center Program Coordinator, Veronica Lopez pictured with Rich Weyrich and Rosemary Kaholokula from the Skagit County Prosecuting Office. Dr. Francie Chalmers, Brigid Collins Board Member and local pediatrician, is testifying to the Early Learning and Human Services Committee in support of HB 1661, regarding the creation of the department of children, youth and families. Thank you for standing up for children Dr. Chalmers!